It actually makes no sense that I long for flowers right now. Oh it's not the hottest time of the year, that will be a couple of months down the road, but it's getting there. I think it's "only" the lower 90's today. Even though the temperatures say it's way too hot to be outside digging, I see others out there doing it as well. We just can't help ourselves! Longer days, lots of sunshine to bring blossoms, and it is hard to resist a pretty flower. The place where I used to create my garden pots is torn down. It was getting old and needed to be taken down for the backyard redo. In place of what we tore down, I've been planning something like this for years. And years. 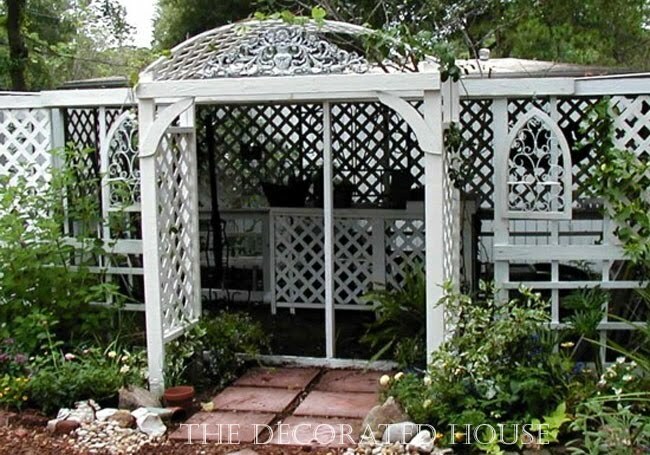 Annie Brahler's arbor is my starting point for a new covered arbor and sitting area. For awhile I've loved the look of natural wood on top and the white columns. Of course her beautiful dogs certainly add to the ambiance! 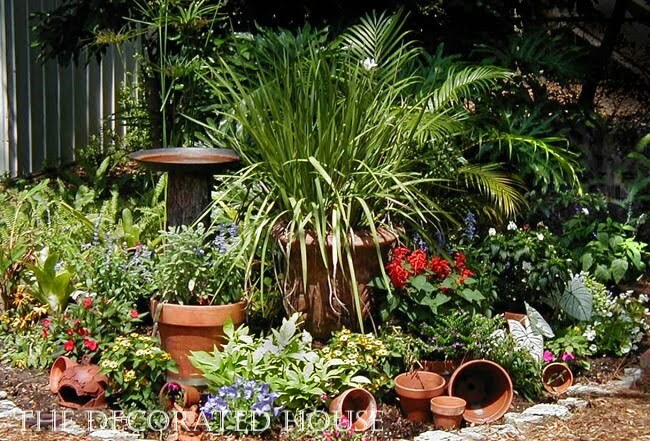 It might be Fall before the major gardening actually gets underway. There is so much more heavy duty work to do first. But good things come to those who are patient and will to get to dirty. Or those who start out with a big bank account and don't have to get dirty, I guess. But I've never minded playing in the dirt from the time I can remember. Pretty post! I love the arbor and I even have the Goldens to go with it! LOL! 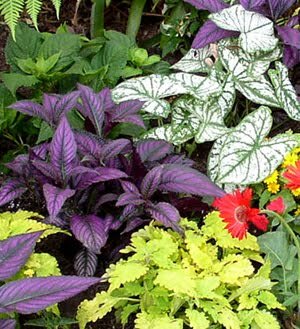 HI Donna, I am just addicted to pictures like this and enjoy dreaming of creating beautiful little and big areas for the outside. We have a huge porch and back patio and I find that I need large ideas not small little pots with little plants....I need to think bigger. I love this arbor you showed...it is just wonderful. I LOVE the old potting room! I saved that photo for inspiration when you showed it a few years ago. Love the arbors too. Whatever you do will be fabuloous as always. In my crystal ball, I foresee a magnificent pergola in your future! I thought I wanted an arbor, and the carpenter built one a few months back. But then I decided I wanted an actual roof, so he tore the top off and made a roof. I LOVE it! I sit outside in the rain and listen to the birds and my waterfall. If you want to see it, it's on my next to last post at the bottom I think.